As of the beginning of this month, lots of news outlets have been reporting on a new deal between big Virginia utility company Dominion Energy and a name that’s not as familiar to local residents – Hecate Energy LLC. The news involves Dominion’s acquisition of more solar production in Clarke County, to the tune of 10 megawatts. Hecate Energy is a Chicago-based company. A Zacks Equity Research report shows how Dominion’s total solar holdings have gone to over 400 megawatts in the state of Virginia, and how the company wants to add 500 megawatts in solar eventually. Zacks reports Dominion has invested $2.6 billion to develop solar projects in just the last four years. The new Clarke County acquisition is built on 117 acres in White Post, Virginia. According to reports, it is now up and running. There are also announcements that Dominion is seeking another 20 megawatt project in Northampton County, also done in partnership with Hecate Energy, to be launched later this year. Clearly, Dominion is active in acquiring solar resources in multiple areas of the state. After detailing some of these plans, the Zacks report goes into the big picture, questioning whether federal support for coal could hurt renewable energy. However, right now, it’s clear that Dominion is one of many big companies looking to hedge into solar, anticipating the eventual decline of the fossil fuel industries. Reports like these show how important solar acquisition is for mega-companies and big regional utilities — but what about small businesses and homeowners? Solar power can really make a difference there, too. With net metering opportunities in place, local residents can harvest energy from the sun and get credits on their electric bill. That makes this a great time to get into the solar game on a smaller scale at the same time that some of the biggest companies are recognizing the benefits of getting into renewables. 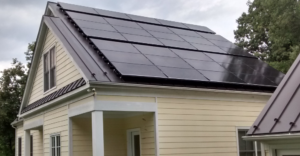 Sun Day Solar helps small businesses and residential customers to set up active solar projects in and around Charlottesville and Albemarle County, Virginia. Let us help you to plan out a solar project and figure out how to do it in the most practical and affordable way. We’ll look at your plot of land and help brainstorm how solar installation will work, and we also know some of the details around applying for relevant USDA grants and some other opportunities. Get on the path to solar energy with a trusted local partner, and enjoy a more sustainable energy solution for the long term.